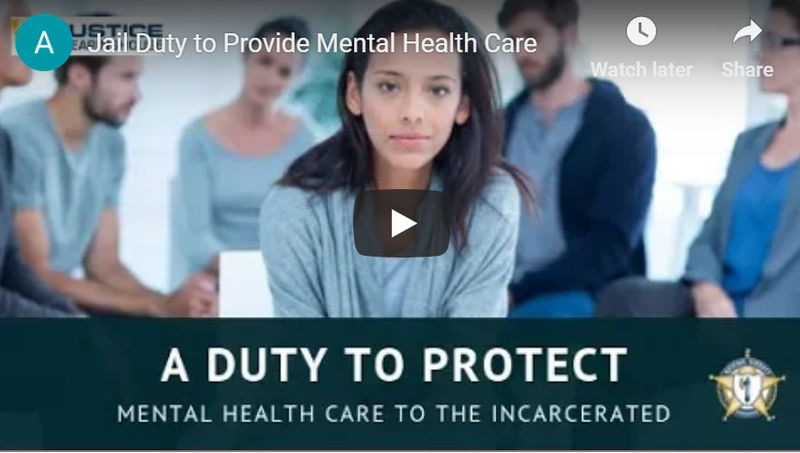 Webinar presenter Carrie Hill answered a number of your questions after her presentation, “A Duty to Protect: Mental Health Care to the Incarcerated.” Here are a few of her responses. Audience Question: Do you have any suggestions on responding to attempts to attain court orders mandating medical treatment from a facility? Carrie Hill: That comes down to strategy. 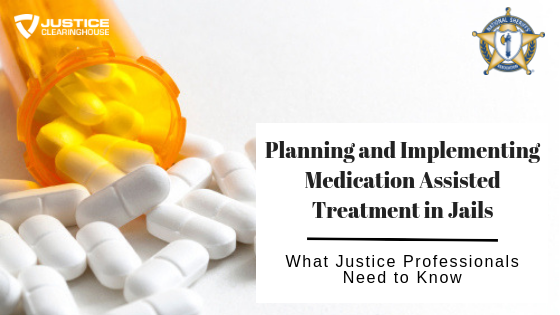 We have many attorneys who are trying to get access to certain medications for their clients. It could be everything from sleeping pills to maybe they want a certain type of psychotropic meds. Bottomline is making sure you use Estelle v. Gamble. It gets on point that the treating physician in the facility is the one that we must go to. In addition, I want to make sure that you use Ward v. (indiscernible 1:16:52), that Supreme Court decision, where the court used the word substantial deference must be given to the jail administrators, and I would argue their treatment staff as well. They know best why these medications, or whatever the treatment protocol is. Use that, and also use Turner v. Safley, that we have a legitimate governmental interest. Many times, again, certain prescriptions, that outside treatment providers may want could pose a threat within the walls of our facility. Again, use Estelle v. Gamble, use Florence, and then use Turner vs. Safley. Really focus on those and hit hard on them. Audience Question: Where is there more information regarding the Kingsley Test for forced showers in correctional facilities? Carrie Hill: We really don’t have a case on forced showering but for many times it becomes a medical issue and it also involves a use of force. What ultimately happens if we challenge that is they’re going to claim that there was excessive use of force, right? What we’re going to say is no. The threat received and the need to do something came because we had medical and mental health involved, which we want them involved so it becomes a medical decision. Then we’re going to use Kingsley and we’ve done a previous webinar on Kingsley and I’m more than happy to talk with you about it. When we use Kingsley then we can lay out all of the different reasons and understanding that we did crisis intervention. We tried all these different tactics, we involved medical. We talked to the inmate. We gave them time to respond to our orders. I hope that helps you a little bit. The reason I want medical and mental health involved is I want them to show the immediacy and why it poses a substantial risk. After that, explaining that to the inmate and if the inmate’s still refusing, then we’ll use again, talk about different options. But ultimately, at some point, you may have to use force and if you do, I need to make sure that you’re following the protocol with Kingsley. Audience Question: Is there a recommended timeline by which a facility should respond to a grievance to avoid liability? Carrie Hill: I’m going to argue definitely that is the Supreme Court didn’t give us a timeline and they won’t because they’re going to give substantial deference. I’ve seen agencies that will go 5 to 7 to 10 business days for the agency to respond. Just remember that if you’ve given an extension to yourself, you want to make sure that you give an extension to the inmate. We do have Supreme Court decision on point regarding timelines but the court has never said he had to have timelines. All they said was, if you do have timelines, then the inmate must adhere to those timelines. Again, with the caveat that you give an extension, you may want to give extension depending upon the seriousness of it. The Supreme Court is going to lead that to you and I’m more than happy to again talk with you a little bit further on that one. Audience Question: How do jails handle inmates who lacked insight that they have a serious mental illness and therefore, do not adhere to treatment? Carrie Hill: That’s one of the greatest challenges, isn’t it? That there may be that inability to understand, right? Even the ability to consent. That’s where your mental health professionals play such a pivotal role and they’re really going to rely on you that, “Is the inmate eating?”, “Is the inmate understanding orders?”, “Why isn’t the inmate taking their medications?”. Is it possible that we may need to do some type of forced commitment? The answer is yes. But the officers and deputies are critically part of that when we present that to the court. 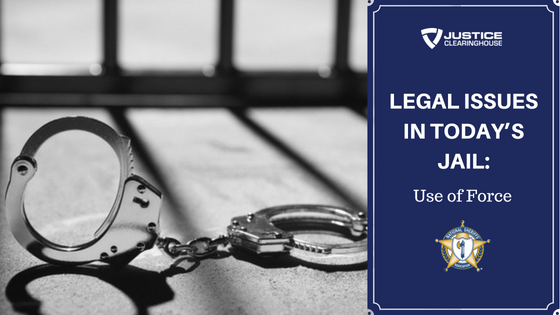 The inmate situation does create a substantial risk of serious harm. The inmate doesn’t understand their mental illness. That because of that, they are a substantial risk to themselves and others. We would lay out all of the different elements. That can’t be done alone just by our mental health treatment staff. It’s got to be done in conjunction with our security staff as well because you interact with them each and every day. It’s one of the greatest challenges which is why it is so important to have qualified mental health professional assisting you. And we have extraordinary partners who can help you as far as who those individuals should be, to make those decisions. 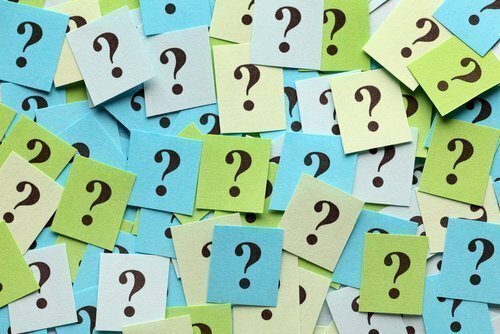 Audience Question: With juvenile inmates, is a health services officer permitted to notify a corrections counselor if the juvenile is not medication compliant? Carrie Hill: I would argue in that situation and I have to think this through here. I would not be comfortable in that situation with a counselor at that point. If you’re talking about probation and parole, would that make a difference for me? Yes, because it would be a condition of that treatment. I’m not sure if we’re looking at is the condition of that they have to take that in order to participate in some of the counseling or some of the programs. I’m not quite sure if I’m missing anything. HIPAA, in that situation, I hesitate to give you a yes or no. I would be cautionary because I think I need some more information. I always say this, you’re welcome to reach out to me and we can kind of talk through it. By the way, not all correctional officers need to know an inmate’s medical history. It is truly on a need to know basis, right? But there are ways that we can get around HIPAA not because we want to get around it but because we have an exemption for law enforcement specifically within the jail environment. But we also want to make sure we’re adhering to it because the penalties are pretty severe. I’m happy to talk about it, I just need more facts. Audience Question: What role can and does the county medical health facility have in the coordination of services? We have found them an extremely useful partner — they usually have previous contact with mental health inmates as well as providing acting as a resource for the release of the inmate back into the community. Carrie Hill: I can’t thank you enough for sharing that. This is a great place to end. The jail is a reflection of our community. The county works together. That is that beautiful handoff. That is that beautiful reaching out to one another. What do we know? Although it’s not a duty for the jail necessarily to reach out but why wouldn’t we, right? Because the county has the necessary resource and you guys don’t just think of it as a reentry, passing the inmate into the community. But more importantly, the county can come in and provide so many of these extraordinary resources to you. If you haven’t already done so, this is where we all work together, right? And so, bringing in that county mental health partners, medical partners, one hundred percent, I am so supportive of that. Our county partners are there, NACo, what extraordinary partners to have and that’s the National Association of Counties. 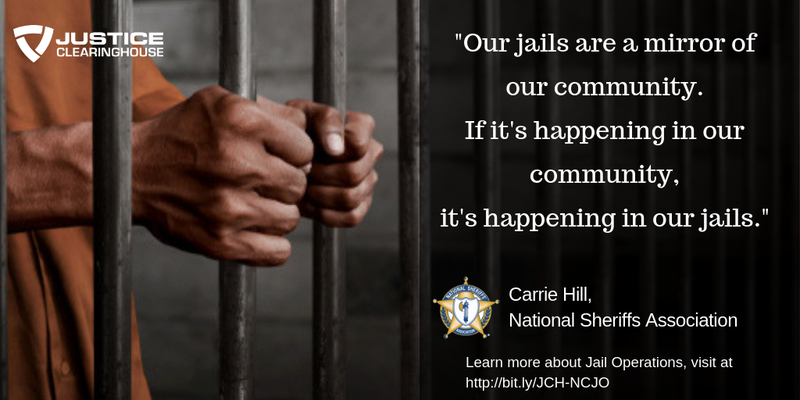 Let them work with you on those programs that are available in the community to bring in to the jail as well as ways that we can partner for reentry to help do that warm handoff for our inmates into the community. I think that’s a really great way to end because it truly is about collaboration. Although it feels like we’re in this alone, we are not. And we are raising more awareness, we have the support of the administration as well as the Department of Justice. We have extraordinary partners with SAMSA, BJA, US-DA, the National Institute of Corrections. If you haven’t reached out, they’re just extraordinary partners — and continue to support them. We have private partners out there, NCCHC, so many wonderful partners. You are not in this alone. I’m always here as a resource for you.